Originally a larger dog descended as sled dogs in Iceland and Lapland, the robust and sturdy Pomeranians made their way to Pomerania (now the area of Germany and Poland). After the UK Kennel Club first recognized the breed in 1870, Queen Victoria began breeding and showing Pomeranians in 1888. She began breeding them down to the size they are today. The breed is popular for their agility. Pomeranians are very outgoing, intelligent and lively little dogs, making a delightful pet. Clean in their habits, they have an affectionate nature, and are clingy with their owners. Poms are a very inquisitive and love to be included in all the fun and games, thriving on human companionship. A small house and yard is sufficient, as they do not require much exercise, but they need to be kept occupied as they have a tendency to be noisy. This makes them good little watch dogs as they bark when someone comes to the door. It is not the temperament of a Pomeranian to be snappy or bite. Behaving aggressively in this manner may be due to bad breeding or treatment – this is human error, not the normal behavior. 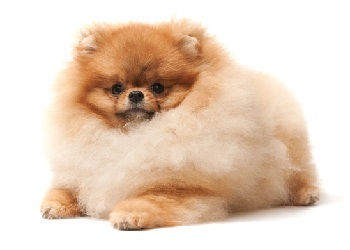 Pomeranians have a long double-coat that needs brushing once a week and combed out every three weeks. Remember not to over groom as that would ruin its undercoat. A daily walk and play will take care of their exercise needs. They may be picky eaters. Like all dogs, Poms require regular tick, flea, intestinal worms and heartworm treatments. Consult your vet on options for treatment, including the diet best suited for your pooch. Desexing and vaccination against contagions, like as the parvo virus and highly infectious canine cough, are also important to discuss with your veterinarian. The small Pomeranians require gentle handling and therefore make a good companion for elderly persons, adults and families with older, gentle children. They are good for apartment living, are active indoors and will be happy without a yard. They are sensitive to hot weather. Because of their size and adorable nature, many Poms fall victim to ‘small dog syndrome’ where their owners raise them to think the dog is the pack leader. This can lead to many varying degrees of behavior problems, which are not Pomerarian traits, but behaviors brought on by the way they are treated by humans around them. Common hereditary problems Dislocated patella (knee-cap), collapsing trachea and eye problems (PRA).